KellyJones.ca | Why wasn’t I invited? Keeping up with the Joneses acquired a whole new meaning on Friday night. It now means trying to break the world record for the largest gathering of people with the same last name. More than 1,220 people whose last name is Jones converged on Cardiff, Wales, to break the record. 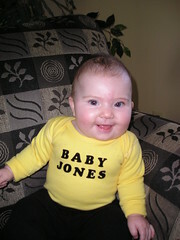 Jones is said to be the most common surname in Wales, but many came from as far away as Canada, Australia and the United States. Singers Grace Jones, Dame Gwyneth Jones and Gwyn Hughes Jones performed for their namesakes. Welsh singer Tom Jones  born Thomas Woodward  sent a special message to those who gathered. Attendees had to present photo identification or birth certificates to Guinness World Record scrutineers.